Yesterday we told you about the death of Sherwood Schwartz, the creator of Gilligan's Island, among other TV series. Now, most people would scoff at the idea of Gilligan's Island being highbrow entertainment - but, in fact, here is a series that one could argue was amongst the most learned on television. 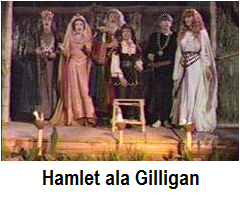 Why, they were able to present not only Shakespearian tragedy, but dramaticopera - and all in the same episode! It was October 3, 1966 - the third and final season of Gilligan. This episode, entitled "The Producer," involved famed Broadway producer Harold Hecuba (Phil Silvers), who finds himself, like so many before him, stranded on the island. (Is it just me, or does it seem as if the only people who weren't able to find that island worked for the Coast Guard?) After Hecuba insults Ginger, the castaways decide to show him how talented she really is, by (in the words of Mickey Rooney and Judy Garland) "putting on a show." Not to be outdone, here is Ophelia (Ginger) in her duet with Hamlet, urging him to lighten up, to Offenbach's "Barcarolle" from The Tales of Hoffman, along with the same piece as heard in the opera. Finally, there's the showstopper, as the entire cast lampoons Bizet's "Torreador Song" (again from Carmen). Not quite the same impact as in the original, perhaps, but not bad. What is brilliant about this is not only the creativity of the lyrics, but the use of music that, in the days when classical music was actually part of mainstream American culture, would be instantly recognizible to most viewers, even if they didn't know where it came from. And I can't help but wonder if the writers were aware of the appropriateness of using music from French opera, given that the most famous operatic version of Hamlet is by the French composer Ambroise Thomas. We may ridicule a show like Gilligan's Island, which was critically scorned but was a massive hit with viewers - but I doubt you'll see anything short of Looney Tunes that makes such good use of classical music. And that is nothing less than a shame.